Emily McDonald first came to Cortez Quilt Company to take Beginning Quilting last year. Not long after her class we decided to hire a part-time employee to work a couple of afternoons each week and we immediately thought of her. Many of you have met Emily here in the shop. Well, time flies and Emily is now a HIGH SCHOOL GRADUATE! She has a bright future ahead of her with plans to become a physical therapy assistant. The happy news for us is that she doesn't begin her education for that career until January, so you'll be seeing a lot more of Emily here at the shop between now and then. Emily, we are so proud of you! 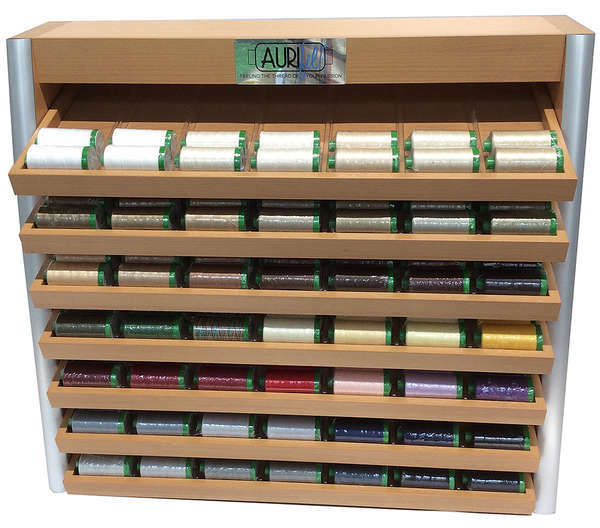 We've added a new line of thread to our inventory - Aurafil. This high-quality, 50-weight thread is manufactured in Italy and it's great for piecing, quilting, machine and hand applique, and more. The spools are 1,422 yards . . . perfect for your larger projects. If you've never put Cuddle fabric on the back of quilt consider it the next time you want something to be extra-cozy. It's as soft as a baby bunny! We received a few new colors last week. This placemat is so fun to make! Encase batting inside 2 1/2 inch strips and sew them together to make the sides. Then choose a coordinating fabric for the centers. 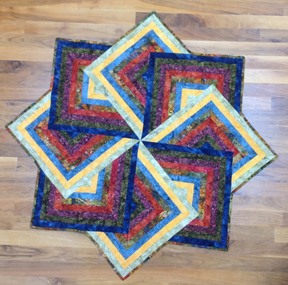 You can quilt the center using a simple straight-stitch design or use this as an opportunity to practice your free motion quilting. We did pebble quilting in the center of the one shown here. The pattern is nice because it includes three different layout choices as well as a tablerunner. Karen Childress will teach this class. NOTE: Placemat Club will be on vacation for the summer and will return in September. This pattern has been around for a long time and continues to wow. When we called the designer recently to make sure it would still be available for us to make kits and schedule a class, the answer was “this one isn’t ever going away.” Love that! Judy Bryan made the sample and will teach the class. Minimal homework (only a bit of fabric cutting) and you should finish this project in a day. Bonus . 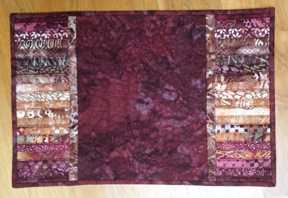 . . learn how to make continuous bias binding. The table topper measures 44″ x 44″. we're offering a series of youth classes this summer. The dates are . . .
12 - 15 year old students - June 2, 9, 16, and 23 from 1:30 until 4:30 p.m. each day. These are Tuesdays. The projects are . . . Session #1: Pincushion and a drawstring bag to carry sewing notions. Session #3: Wall hanging with pockets using chalkboard fabric. Session #4: Quilt block wall hanging or table topper. The cost of the four-session series is $129 per student. 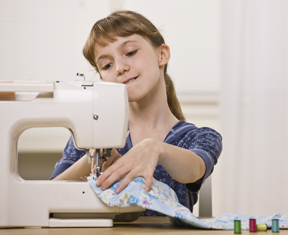 This fee includes ALL supplies and the use of a sewing machine. Each class is limited to eight students. Please call 970-565-7541 to register. 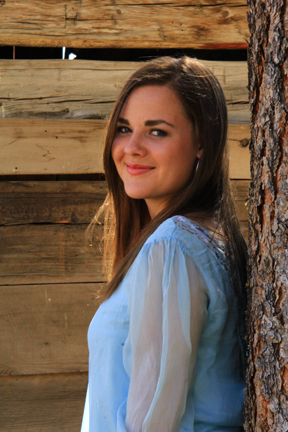 Aimee King will teach our youth classes. NOTE: Parents/grandparents/guardians will not be allowed in the youth classes and must drop off students at least ten minutes prior to the start of each session and may not arrive for pickup until the end of each session. Parent or guardian will be required to sign a release of liability form and provide emergency contact information. Sign up for Class Club or extend your current membership and enjoy unlimited classes for a full year for only $195 (regular price $225). This offer expires at 5 p.m. on Saturday, May 9. Class Club memberships make great Mother's Day gifts so drop hints as needed. This anonymous applique student had fun in with us recently. 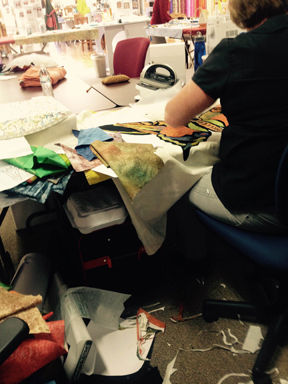 One benefit of attending classes at Cortez Quilt Company is that you can be as messy as you'd like and we do the clean up. What could be better? Did you make our most recent mystery quilt? If so, we hope you’ll have it finished and ready for Show & Tell on Saturday, May 9 at 9 a.m. Even if you didn’t make the mystery quilt this time, please join us to see what others did and get in on the next mystery which will be available for registration at the Saturday gathering. 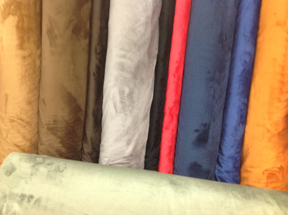 Purchase fabric for your project on “reveal” day and receive 10% off! Join us on Thursday, May 21 when Cindy Dahl will share a variety of ideas on how to make quilt labels. 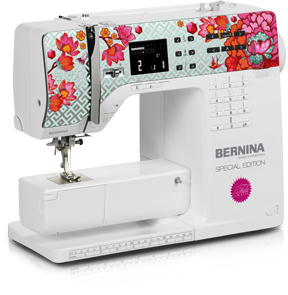 If you attend the 12:30 session you have the option to stay from 1:00 – 3:00 p.m. and use our BERNINA embroidery machines (with assistance!) to make up to two labels of your own. Please bring the fabric (12″ x 16″) you wish to use for your label and there will be a $5 supply fee (stabilizer and thread) for each label. Now we're really down to the wire. 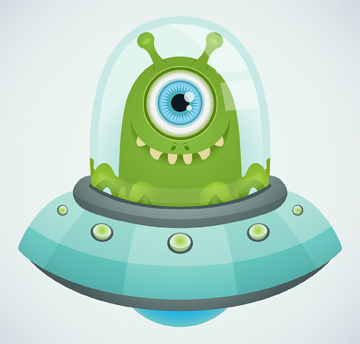 UFO Challenge projects are due by 4 p.m. on Tuesday, May 26. With that deadline in mind, we've scheduled two UFO Work Days here at the shop. Bring you projects and buckle down to get them done without the distractions of home. Dates . . .
Friday, May 8, 10:15 a.m. - 5 p.m.
Friday, May 15, 10:15 a.m. - 5 p.m.
Bring your projects, machine, and lunch. These work days are FREE but seating is limited so call 970-565-7541 to reserve your space. The new 350 Special Edition machines arrived last week. The faceplate designs are by Ricky Tims and Tula Pink. 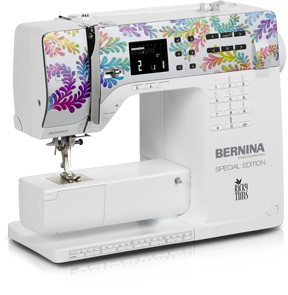 Aside from the fact that these machines are SO pretty, they come with some extra features for the same price as a regular 350PE. The extras are full shank feet, a quilting foot, additional decorative stitches, and a very nice accessory case. We ordered two each of these special edition machines and one of each has already sold. The other two are still available so come in today! If you love chocolate you will love these kitchen towels embroidered with chocolate recipes. The recipes are stitched with small letters that you will learn to successfully embroider. These towels make great house warming or wedding gifts. Please register by noon on Monday, May 11 by calling Cortez Quilt Company at 970-565-7541 or sending an email to Cindy. When someone comes into the shop looking for a new rotary cutter the first thing we do is gather up all the ones we have and let the customer try them out. 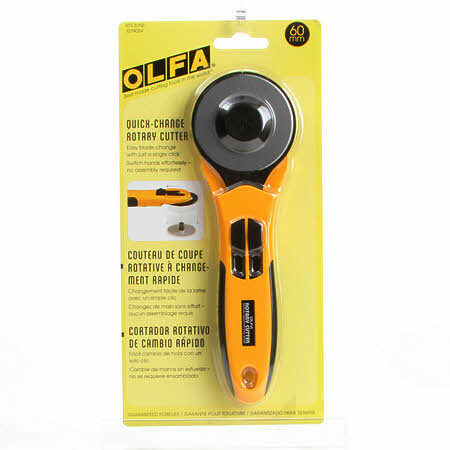 It's important to have a rotary cutter that feels good in your hand and has the features that are most important to you (e.g., quick-change blade or auto-close). As far as size, most quilters use a cutter with a 45 mm blade, a few prefer the larger 60 mm, and the 28 mm size comes in handy for certain types of projects. Price is also a consideration and we stock rotary cutters from under $20 all the way up to $79. Once you've invested in a new rotary cutter you'll naturally want to take care of it so that it lasts as long as possible. Always keep the blade closed when the cutter is not in use. This is for safety first and foremost, but also to keep the blade from bumping up against something and getting nicked. Be careful not to accidentally roll your cutter over straight pins. This will nick the blade in an instant. Keep an eye on your cutter and notice when lint begins to build up in it. When this happens, take the blade out and gently wipe the lint off both it and the cutter with a Kleenex of piece of scrap fabric. Be extremely careful doing this, and also when changing blades. How often you change your blade depends - of course - on how much you use your cutter. If you're working with flannel or denim you might notice that those fabrics dull your blade a bit faster than when you're using thinner quilting cotton or batik. Don't struggle or become frustrated using a dull or nicked blade. If you have to apply a great deal of pressure to cut your fabric or if you're consistently having a "miss" in your cutting, it's time for a new blade. Remember - just like a kitchen knife - you're more likely to have an accident with a dull blade than you are with a sharp one. Dispose of used blades carefully. We don't recommend tossing them into the trash can without wrapping them inside something or putting the old blade inside the case that the new one came in and taping it closed. These blades are uber-sharp when they're new but can still do damage to a finger when they're dull. smell, catch fire, or block the refrigerator door, let it be.